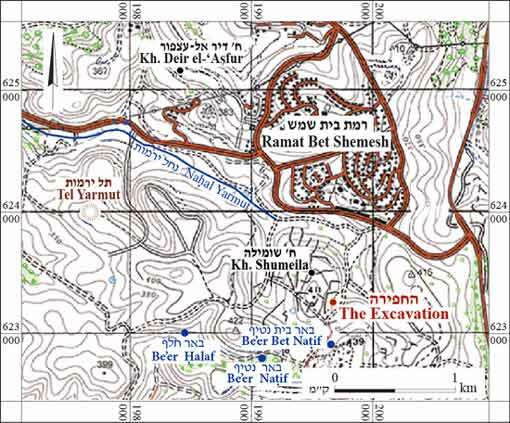 In January 2014 an excavation was conducted in Ramat Bet Shemesh, along the eastern slope of a hill (Spot Height 411) that descends south to north toward Nahal Yarmut (Permit No. A-7003; map ref. 199565-609/623211-55; Fig. 1), prior to construction. 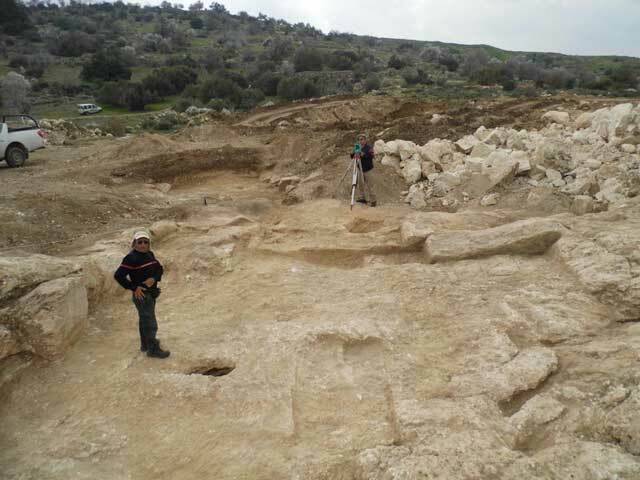 The excavation, undertaken on behalf of the Israel Antiquities Authority and financed by the Ministry of Housing, was directed by D. Ein-Mor (photography), with the assistance of N. Nahama (administration), S. Gendler (inspection) and A. Hajian and M. Kunin (surveying). Remains of a quarry were exposed during an antiquities inspection conducted by D. Gelman at which time the terra rossa fill was carefully removed from above the bedrock (c. 8 × 12 m). 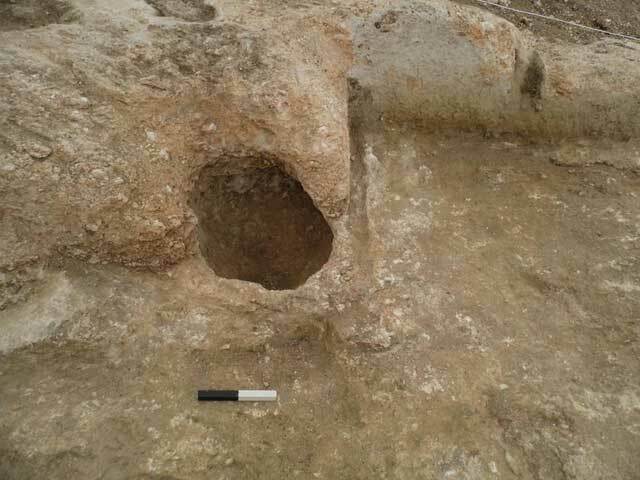 Remains of other quarries were revealed during an antiquities inspection performed along the entire eastern slope of the hill, at the foot of which the excavation was conducted. 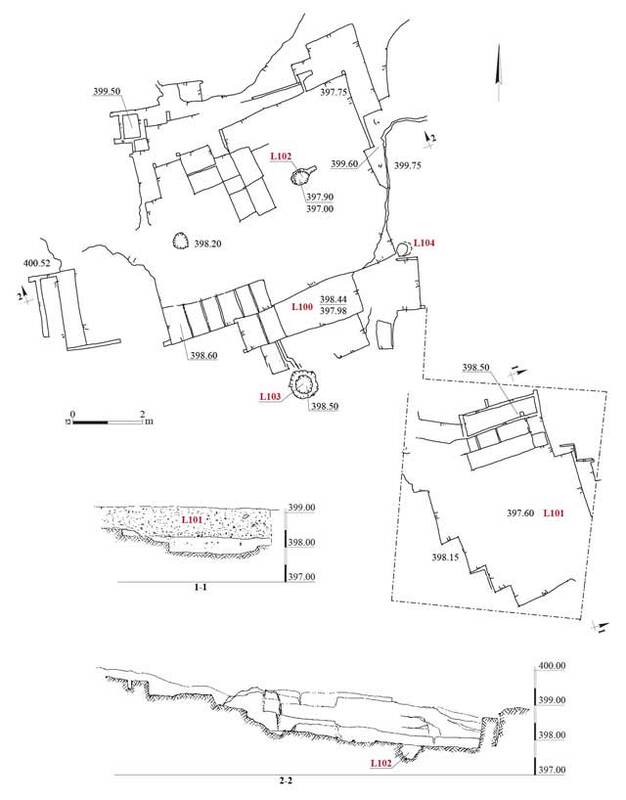 The excavation area was located c. 450–500 m (in a straight line) from the center of the remains of the village and the ruins of Bet Natif (Fig. 2). Two excavations were carried out nearby during 2013. In the first excavation (Permit No. A-6740) remains of quarries, a ritual bath (miqwe) and agricultural installations were exposed in the vicinity of the southeastern slopes of Spot Height 411; in the second one (License No. B-400/2013) remains of a quarry and the foundations of a building from the Ottoman period were uncovered. The current excavation, which was situated adjacent to the eastern and southern sides of the second excavation, continued the exposure of the quarry. It was evident at the beginning of the excavation that the area had been disturbed by the contractor’s mechanical equipment and by the antiquities inspections that exposed the area of ​​the quarry remains. Terra rossa fill was removed from above the bedrock during the excavation. Presumably the fill was related to agricultural terraces that were once there; however no evidence of said terraces was visible at the start of the excavation. The thickness of the fills varied from place to place, depending upon the inclination of the bedrock and natural deposits and the rock-cuttings that were made there. The finds recovered from the fill were minimal and consisted of several ribbed body sherds of jars (not drawn). Wherever fill was excavated, bedrock was exposed beneath it (a total area of c. 160 sq m), on which there was evidence of rock-cutting. 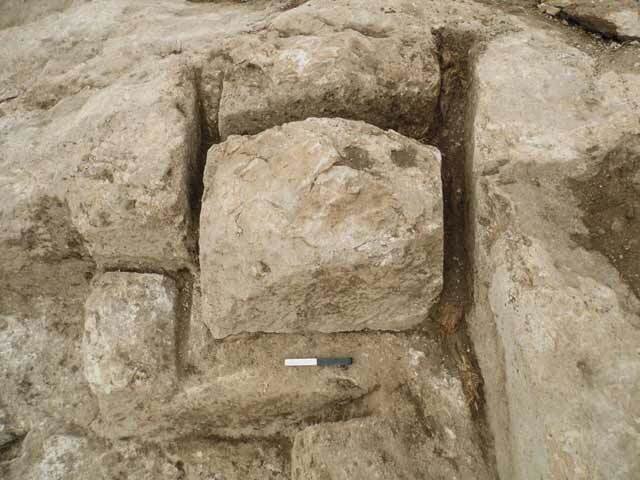 The excavation at the site was conducted in two rectangular areas, within the confines designated for construction: a northern area (10 × 13 m) that was completely excavated and a southern one (5.5 × 6.7 m) whose excavation was not completed (Fig. 3). A. The first step involved marking the blocks intended for quarrying. In the western part of this section, six shallow rectangular rock-cuttings (0.5 × 0.9 m, depth c. 2 cm) were discerned on the bedrock surface (Fig. 4). The quarrying of a shallow channel marked the desired outline of the building stones prior to quarrying. The quarrymen made sure to leave a fixed clearance of c. 0.1 m between the blocks, and severance channels were cut in this space. B. The second step involved the cutting of severance channels (average thickness c. 0.1 m). A block (0.4 × 0.7 m, height 0.45 m) in the northwestern corner of this part of the quarry was separated from the bedrock on all sides by severance channels; however, its base was not detached from the bedrock (Fig. 5). The severance channels on the southern and northern sides of this block indicate that the quarrying was done from the top down, that is, from west to east. C. In the final step of the quarrying the blocks were detached from the bedrock. After the severance channels were hewn around the stone block it was possible to separate it from the bedrock with a chisel or bar. The size of the negatives of the quarried stones and the chisels marks were not uniform (average block length c. 1 m, width c. 0.4 m). Two circular rock-cuttings (L102, diam. 0.7 m, depth 0.6 m; L103, diam. 0.4 m, depth 0.5 m) were exposed in the excavation area, and they may have been related to installations that predated the phase when the area was used as a quarry. Another possibility is that these rock-cuttings were used to secure a wooden post that supported a light-weight roof. A hewn niche (L104; diam. 0.3 m, depth 0.5 m, Figs. 3, 6) was exposed in the southeastern corner of this part of the quarry. It was apparent that part of the western side of the niche was removed during the rock-cutting activity; hence the niche predated the quarry. Thus there were presumably installations on the bedrock that were negated as a result of the quarrying. The excavation of the southeastern section was not completed by the end of the fieldwork; however, chisel marks were also visible there on the surface of the bedrock. Judging by the section in the eastern part of the excavation area, terra rossa fill (L101; thickness c. 0.9 m) had been deposited on top of the quarry. The color of the fill changed within a few centimeters (0.1 m) above the bedrock from reddish brown to light brown, and the fill was mixed with weathered rock. Almost no pottery sherds were found in this fill. The few potsherds that were discovered on the surface were non-diagnostic, ribbed body fragments of jars. The excavation revealed that the foundations of the Ottoman building, excavated in 2013 and completely dismantled prior to the excavation, were adjacent to the western side of the quarry and partly covered the quarry. Hence, the first phase in the use of the quarry preceded the construction of the building. However, the absence of ceramic finds or any other datable artifacts made it difficult to determine the period when the quarry was used or to negate the possibility that it continued to be used during the Ottoman period. Many building stones are scattered in the vicinity of Spot Height 411, some of which were incorporated in secondary use in the fence lines and agricultural terraces. Numerous cavities were hewn in the eastern and southern slopes of the hill, such as cisterns, burial caves and agricultural installations, indicating the existence of a settlement in ancient times. Pottery sherds dating to the Roman and Byzantine periods were scattered on the bedrock surfaces and agricultural terraces. 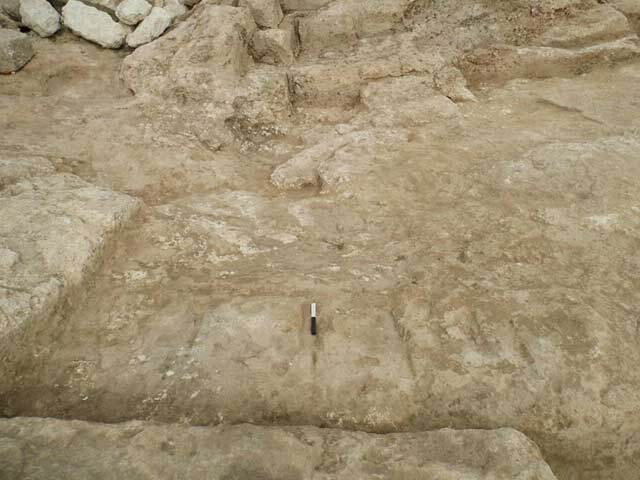 It is therefore probable that the remains of the extensive quarries, parts of which were exposed in the excavation, were connected to a settlement near Horbat Bet Natif. It is likely that some of these quarries were also used during the Ottoman period, at the time of the Arab village of Beit Natif. 2. The excavation area, in the background is one of the hills where Horbat Bet Natif is situated, looking southwest. 4. Six shallow rock-cuttings, looking north. 5. A block that was not detached from the bedrock, looking east. 6. Niche 104, looking east.